I don't actually watch the show. I've heard it great. And racy. But I'm just bandwagoning since it fits my post. Just because I'm going to use some orange. Tasteful orange. So we have a guest room. This year we even had some guests. They had to sleep on the floor - well, a foam mattress topper. So, the floor. We really know how to be hospitable hosts. Thanks for visiting guys! It was our storage room. I mostly just kept the door shut to feel better about life. We simply didn't have places for everything (or anything) yet. But I made our living spaces comfortable by shoving everything in here. Then my parents came and I shoved it all different places. Some of it is still shoved in those places. Oops. A few months ago I found the bed I wanted, stalked Craigslist, had three slip through my fingers, then finally scored. It's an Ikea bed that they discontinued. Got it in the room and it totally dwarfs the space. I could pretend it's a statement - like oversized art. But, really, it's just too big for the room. We really wanted a queen bed so couples could fit comfortably. And I wanted it centered so guests can get in on both sides - it's so awkward to climb onto the far side of the bed. Ever been there? If you're on the wall side and need to go to the bathroom in the middle of the night, that's just too bad! Get mattress slats from Ikea so I can nix the box springs. Lowering the bed will create more visual space and hopefully make the bed feel more size appropriate. Oh, and Stella can jump on the bed. She thinks that this is her room and is annoyed the bed is hogging her sunbathing area. And she abandons us to sleep with my mom whenever she is here. That's not a space issue, just an added bonus to lowering the bed. Create a foot board that's like the side boards. Taking off the current foot board (is that what it's called?!) will make it less busy and guests can sit on the end of the bed/not have to walk around it as much. Change out the pillows. The Euro pillows are tall. And bulky. And hide the headboard I love! Last idea: switching the guest room and Wade's room. Wade's room is bigger and he doesn't do anything in there. Plus, it's at the end of the hall and next to the bathroom, which would give guests the most privacy. Oh, and Wade's room is above the garage, so it's the hottest in the summer and coldest in the winter and babies don't know how to keep covers on or open a window. Hmmm...that got beyond just size benefits, this might be a good idea. Currently this room is not the feel that we want in our house. It's overly feminine for our taste and for the rooms functions. Husband's brother is the most frequent occupier of this room and while he doesn't care, I'd like it to be a more masculine and simpler. Too many knick-knacks and frill is overwhelming for guests. They need space to put their things and need to not worry about disrupting ours. I'll nix the current pillows and really par down on the replacements. I don't need my guests minimal floor space over-run with pillows at night and I don't want them worrying about how to put them back during the day. So, here's my simple and masculine plan for the room. 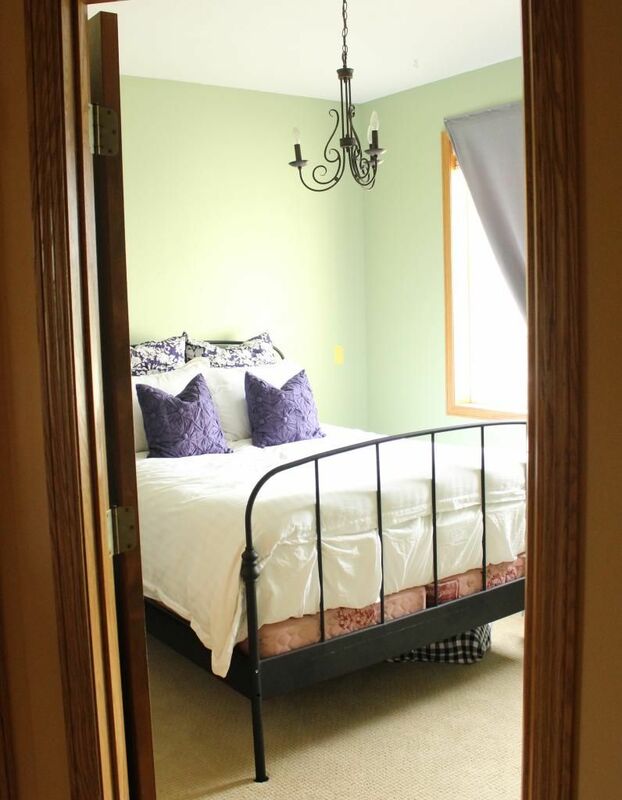 Imagine it with white/cream walls but a forest green accent wall behind the bed! What do you think? It's football season, so I officially have abundant time in the evenings to do what I want! Ha! we have the same bed in our guest room.